The Best Day of My Life So Far: Say Hi to Caitlin.. Yes, She's Stepping Up! After 7.5 years of writing every word on this blog, it's with confidence in my heart and a big smile on my face that I pass the baton to the fabulous Caitlin Cieri. As Best Day of My Life So Far groups grow around the country, it’s time I put more focus into sharing intergenerational engagement tips and methods to more people. Don’t worry, I am not going anywhere ;) I will still be writing you from my heart, but my perspective will be more nationally focused, and I will share primarily via our newsletter which you can subscribe to here. This blog has always meant more to me than a transmitter of our older buds’ stories. It’s always been my personal oasis from day one. If Best Day groups are where older adults get to discover their voices, this blog is the place where I discovered my voice, and discovered my mission in this giant world. I am forever indebted to you for reading my words here, whether this is the first time we met or you have stuck with me for all these years. Even if I have never met you in real life, you mean more to me than you will ever know. I will really miss my blogger role, but I know the person stepping into my shoes is perfect for the role. It’s her turn. It’s her time. Some of you may remember Caitlin throughout the years in volunteer spotlights that I have posted like this one or this one and in posts that I have invited her to write as a guest contributor like this one. Incidentally, it’s International Women’s Day today, and I am honored to have met Caitlin as a young woman 5 years ago and am so proud of the woman whom she has become. And now… here’s a story/letter entitled “Stepping Up” by Caitlin, about how being a part of The Best Day of My Life So Far has impacted her life… so far! Talk to you soon in upcoming newsletters. And feel free to reach out to me anytime at benita@bestdayofmylifesofar.org! Hello, everyone! My name is Caitlin, and some of you may know me as a Lead Facilitator of The Best Day of My Life So Far’s Philadelphia Senior Center Group. My duties include events planning, managing the storytelling sessions, making sure every participant gets their work read, writing for those with disabilities or special needs, familiarizing participants with our websites, training new volunteers and keeping an open conversation between Best Day and the senior center. And now, they will include managing this blog. I first found out about Best Day in 2012, when a coworker took me to one of their Thursday sessions. The first day I was there, I wrote for Joe Garrison. I loved his voice, his attitude, and his appreciation for folk music. After that day, I knew this group was special. I came back week after week and after a while I became a regular volunteer. The only time I wasn't able to facilitate was when I spent a year abroad in England. I missed my older buds so much that I used Hazel's story about her mom dragging her to a lecture by Dr. Martin Luther King for a writing assignment. When I came back to the United States for good, I immediately went back to managing the storytelling sessions at the Senior Center. The older participants are both great friends and great writers, and volunteering at Best Day has helped me a lot. Writing for Joe and Loretta and whoever else came in prepared me for my job as a transcriber. I got better at telling when people wanted to speak and when they didn't in general. They gave both Benita and I solid advice when we needed it, like figuring out how to get my Poppop more active. And they love when I share my writing, both non-fiction and fiction, with them almost as much as I love when they share with me. I am honored that Benita trusted me with this storytelling sessions and I was glad to be there to hear the participants’ stories and get them transcribed for our blog. I remember a conversation we had with the other facilitators about a particularly somber session. Something happened on the news and the older adults wrote about the racism they faced in their lives as an adult. At first we were worried that our older friends would lose their motivation to come if all they heard were sad, topical stories. But when I saw all of what they wrote, I knew I was reading something intimate and personal to them. They trusted us with both their best days and their worst days. That was when I said to Benita, "Sometimes the best day of your life is when you can talk about the worst day of your life." I am even more honored that Benita asked me to run this blog for her, especially since she said it was because of my regular and enduring contact with the older writers. 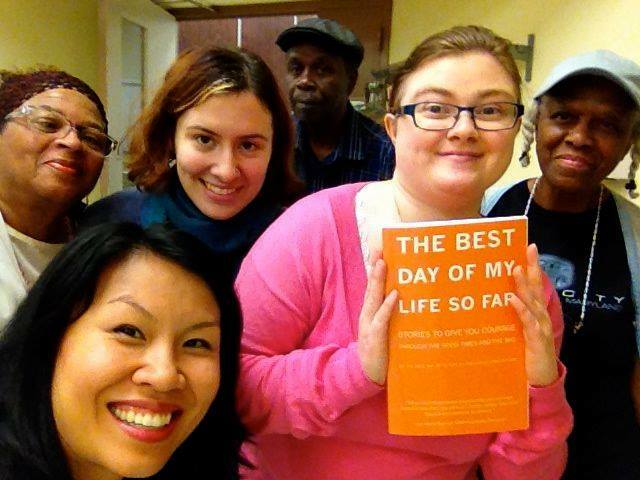 I want to honor the mission statement of Best Day, of ending older adult isolation by spreading stories. This blog has already reunited mothers and daughters, and daughters and grandchildren, so I want to put as many of our participants’ stories as possible on this blog. I’ll miss seeing Benita’s enthusiasm and joy in these posts, but I’m excited to continue her good work.